Welcome to the Department of Special Education at San Diego State University. Our department prepares educators and other professionals to work with people with exceptionalities and their famiies. The majority of our programs prepare special education teachers to work with children with disabilities and their families frombirth through young adulthood. There are also programs for those interested in working with gifted and talented students. The Department of Special Education at San Diego State University offers an M.A. degree in Special Education with an emphasis in Autism. This masters degree embeds an approved course sequence for the BCBA (Board Certified Behavior Analyst). The M.A. degree also embeds most of the Clear coursework for the Moderate/Severe and Early Childhood credentials in California. The course sequence varies slightly based on the age focus (young children or secondary/ transition age youth) of the M.A. candidate in the Autism program. View the current course sequence and learn more about the program. Admission requirements for the M.A. with an emphasis in Autism are the same as for other M.A. programs in the department, with the added pre-requisite course of SPED 553: Behavioral Strategies and Support. For more information on deadlines and how to apply, please visit the Autism Master's Admissions page. Note: Applications received by February 1 will be given priority for admission. Can I take a class toward the Advanced Certificate in Behavior Analysis even though I am not a matriculated student? Are there any online courses at this time, or are all courses taught on campus? Do I need to have a teaching credential to apply for the M.A. degree or Advanced Certificate in Behavior Analysis? Can prerequisites for the M.A. degree be substituted or waived? Can I substitute courses taken elsewhere for SPED 553 or other courses in the programs? Can I take the prerequisites as co-requisites once I’ve been admitted to the program? Can I take the prerequisite courses through Open University? Can I clear my teaching credential in special education at the same time I am taking the M.A. degree? Can I attend the M.A. degree program part-time? Can I complete the Advanced Certificate in Behavior Analysis part-time? Does SDSU provide assistance with the fieldwork requirement for the BCBA? 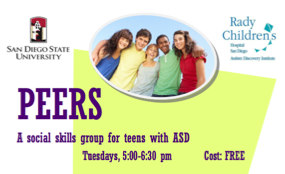 Participants are currently being recruited for the Adolescent PEERS Study, a social skills group for teens with ASD. Teens learn tools for building and maintaining positive friendships. The 14-week study takes place Tuesdays, 5 to 6:30 pm. Participation is free. College of Education Offers Innovative Master's Program with a Specialization in Autism.